Turn your inbox into a task-tracking system by creating tickets via E-mail. PhaseWare’s complete customer support solution offers you the ability to monitor a support mailbox and turn E-mails into tickets that can then follow your escalation and event processing procedures. 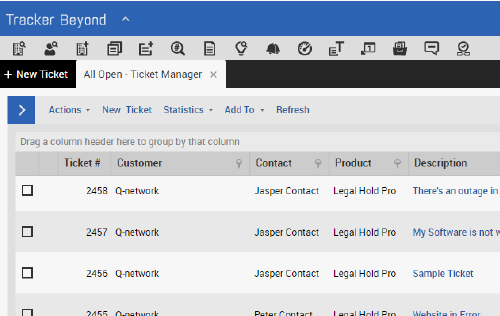 Turn your inbox into a task-tracking system by creating tickets via E-mail. If the ticket creation feature is turned on inside of Tracker, the system will attempt to either create a new ticket or update an existing one each time a message arrives in the system inbox. To create an ticket via E-mail, a client with a pre-existing account can simply send an E-mail message describing the problem to the appropriate team E-mail address. If a matching client account is found and the address that the E-mail was sent belongs to an existing team, a ticket is created in the system. The item and technician details can be changed after the ticket has been assigned. The body of the E-mail becomes the main text of the ticket description. Any attachments included with the E-mail will also be attached to the ticket. The new ticket is assigned a priority type and once the ticket has successfully been created, an entry is added to the ticket history log stating that the ticket was generated via E-mail. The client and the assigned technician then receive E-mails notifying them of the ticket created via E-mail and notifies them of it’s successful creation. With PhaseWare you can now offer your clients true 24 hour availability, even if you aren’t actually there. Let PhaseWare’s help desk management system take you to the next level of awareness and responsiveness.